Apple has landed. And with a suitably grainy artists-impression to match, the plans for the new Apple headquarters in Cupertino, CA have been unveiled at a town planning meeting, by none other than Steve Jobs himself. 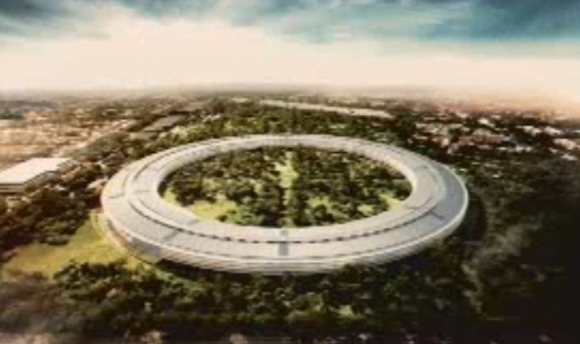 If all goes to plan, the new Apple campus will reside on the 98-acre plot of land acquired from HP last year. The facility will be a four-storey high ring surrounding a wooded courtyard, housing 12,000 Apple employees, and featuring the latest in high-tech curved glass. If approved, the Cupertino campus will allow Apple to host events such as the WWDC and other keynote presentations on-site – something they’ve never been able to do before. The building itself will use an on-site natural gas energy system, hide most cars from view via a massive underground carpark and feature a big increase in natural landscaping over what is currently present. The building is expected to be ready by 2015.